LaMarcus Aldridge surprised everyone with his decision to play tonight scoring 26 points even with a torn ligament in his left thumb. Word got out that LaMarcus would need surgery to repair his thumb but he delayed the surgery and is going to play through the injury. Damian Lillard and Wesley Matthews scored 20 and 19 points respectively as the Blazers erased a 14 point deficit to come back to beat the Wizards 103-96. The Wizards were hot early in this one and it felt like they had an opportunity to blow this one open. The Wiz raced out to a 13-2 lead starting 6-9 from the field. Both Paul Pierce and Bradley Beal came out aggressive and knocked down shots. This was a good sign as the Wizards sometimes lacked that aggression in the OKC game. 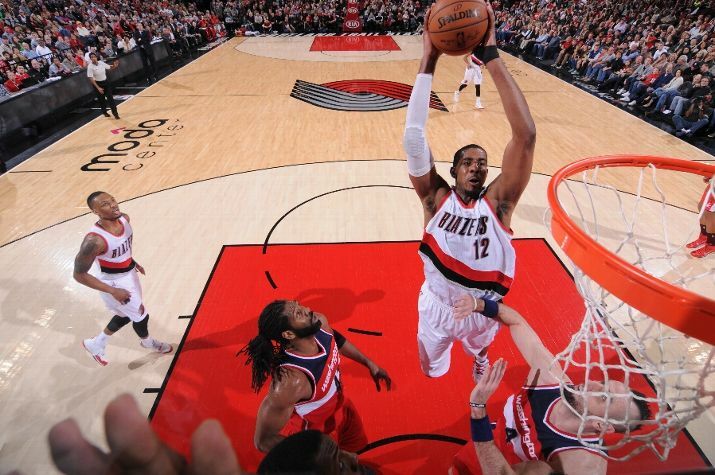 On the flip side, the Blazers started 0-8 from the field and found themselves down 12 at the end of the 1st quarter. Damian Lillard and Wesley Matthews started to heat up in the 2nd quarter. Back to back threes by the back court mates cut the Wizards lead to seven. The Wizards were very protective of the basketball and did not commit a turnover in the first quarter. That did not spill over to the second quarter as the Wiz committed six turnovers in the period. The Wizards used a 5-0 run to end the quarter including a tough fall away jumper from John Wall to stretch the lead to 55-45 at half. They say the first five minutes of the third quarter are very important and dictate the rest of the game. Well, the Wizards played very poorly during this five minute stretch. As the Wizards lead was dwindling, Paul Pierce hit a corner three to regain some momentum. The 3 was Pierce’s 2,000th career 3 pointer. A feat only three other players have reached. Again, Matthews regained his shooting touch in the third quarter hitting threes on back-to-back possessions. Nene tried to answer on a 3 of his own which he missed badly. This whole Nene shooting threes and is a stretch 4 needs to stop immediately, like NOW. The Blazers ended the quarter on a 11-2 run to cut the lead to one going into the fourth. The Wizards executed pretty poorly down the stretch. Turnovers and bad shots allowed the Blazers to take the lead and regain control of the game. Martell Webster got 19 minutes off the bench tonight. He shot just 1-5 from the field and continued his run of missing threes when the game is on he line. In the end, it was too much LaMarcus Aldridge and three point shooting from the Blazers that prevented the Wiz from coming back in this one. Wiz head to Denver tomorrow night to try and stop this losing streak.